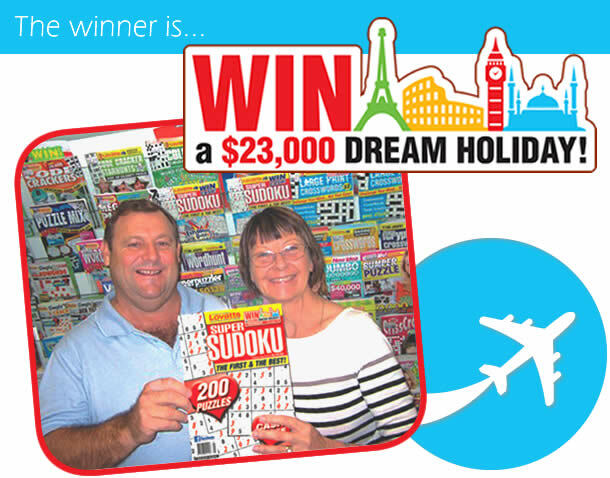 Congratulations to Peter Francis from Queensland, winner of our recent $23,000 WIN A DREAM HOLIDAY promotion. Peter is pictured above with his delighted wife Elva at his ‘lucky local’ newsagency in Sandstone Point. The excited couple will soon be jetting to Europe courtesy of Lovatts and Trafalgar Travel. Well done Peter and happy holidays! Thanks to everyone for participating. We hope you enjoyed your Lovatts magazine. If so, we encourage you to take advantage of the fabulous subscription offers available now on our → online stores. Save money off recommended retail price PLUS go into the bi-monthly subscriber draw for the chance to win some great prizes.